You are going to Watch Naruto Shippuden Episode 381 English subbed online free episodes with HQ / high quality. Stream Anime Naruto Shippuden Episode 381 Online English sub The Divine Tree. With the Allied Shinobi teleported to safety, Kurama allows Naruto to use Sage Mode with his chakra and assumes Tailed Beast Mode as he and Minato attack Obito with renewed vigor. Under both Kuramas’ advice, Naruto and Minato fully manifest the foxes as they use a senjutsu Rasengan on Obito. But the attack has no effect as Obito releases the Ten Tails and has it assume its true form: a giant tree whose roots fatally drain caught shinobi of their chakra. Shocked that Obito is actually carrying out Project Tsuki no Me, Madara reveals to Hashirama that the Ten Tails was originally the source of all chakra in the world: The Shinju. 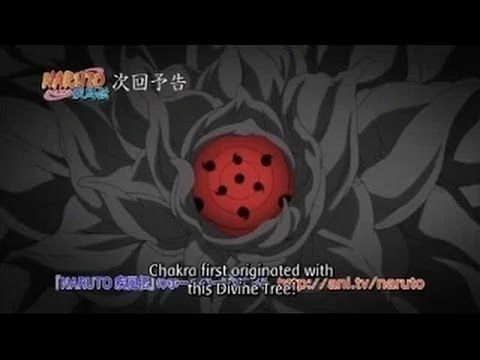 Madara proceeds to explain a legend of a princess named Kaguya Otsutsuki eating the chakra-rich fruit of the Shinju to end an epic war ages ago and that the once neutral tree transformed into an embodiment of its wrath after the birth of Kaguya’s son: The first human born with chakra who would become the Sage of the Six Paths. As Naruto is saved from the Shinju’s roots by Hiruzen, Madara tells Hashirama that he learned the legend from the stone tablet while explaining that the Shinju will could bring the Uchiha Clan’s future as its time of blooming will be the moment the Infinite Tsukuyomi begins.